The Gold-Medallion-winning "New Inductive Study Bible" (over 700,000 sold) is now also available in the trusted English Standard Version. This Bible is based entirely on the inductive study approach, leading readers directly back to the source and allowing God's Word to become its own commentary. Its many exceptional features include: the 2011 ESV text, an essentially literal translation that seeks to capture the precise wording of the original text and the personal style of each Bible writer; a 32-page explanation of the inductive study method, teaching readers how to observe, interpret, and apply the text to their everyday lives; four full-color pages with step-by-step instructions for studying and marking the text; individualized instructions for every book of the Bible; and 24 pages of full-color charts and maps and dozens of unique study helps. This Bible gives believers all the tools they need to discover the riches of God's Word! Esv New Inductive Study Bible by Precept Ministries International was published by Harvest House in August 2013 and is our 25505th best seller. 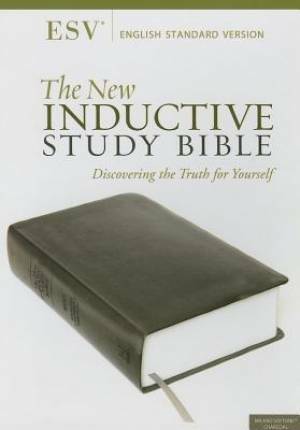 The ISBN for Esv New Inductive Study Bible is 9780736957199. Be the first to review Esv New Inductive Study Bible! Got a question? No problem! Just click here to ask us about Esv New Inductive Study Bible.